Print a frame around the page or spread. 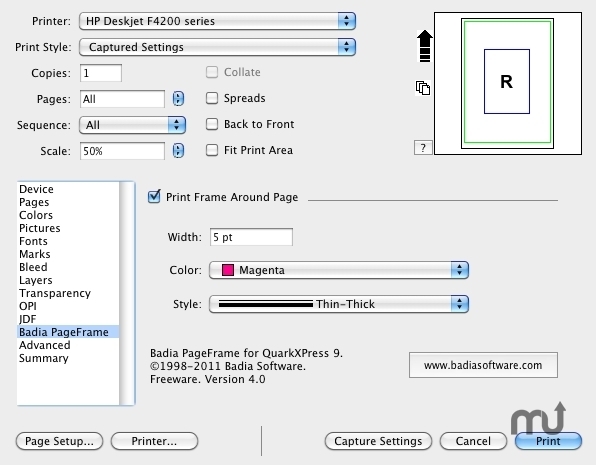 Is there a better alternative to Badia PageFrame for QuarkXPress? Is Badia PageFrame for QuarkXPress really the best app in Author Tools category? Will Badia PageFrame for QuarkXPress work good on macOS 10.13.4? Badia PageFrame allows you to print a frame around the page or spread. Use PageFrame when printing on over sized paper, so you can easily see the page boundaries. Badia PageFrame for QuarkXPress needs a review. Be the first to review this app and get the discussion started! Badia PageFrame for QuarkXPress needs a rating. Be the first to rate this app and get the discussion started!